Summer is here and Boulder is ready! I’ve tracked down 24 events happening in and around Boulder in the month of June — all of which will bring you the very best of the warm, long days of the season. Tons of festivals, amazing arts opportunities, activities for the kids, endless concerts to attend, as well as fun fitness events. Boulder has it all! Cost: Drop-in fee: $15 (cash or check only), Punch Pass: $60 for 5 swims (NOT transferable), Summer Pass: $270 (before May 20th) – $300 thereafter. The Drop-in, Punch and Summer Pass include the entry fee into the Reservoir. Boulder Aquatic Masters hosts bi-weekly Open Water Swims at the Boulder Reservoir throughout the summer. These events are safe, casual, and open to everyone over the age of 18. Perfect for open water enthusiasts, triathletes and swimmers of all abilities. This year BAM will utilize two different courses (see maps here). The “Traditional Course” of approx. 1000 meters with a shorter option available. The “Right Angle Course” of approx. 950 meters. Lifeguards are positioned throughout the courses to assist swimmers. Shore course available for tentative swimmers (approximately 300 yards). For more info, click here. Cost: Ticket prices vary, see schedule here. Bring a picnic basket and head over to beautiful Chautauqua Park for the Chautauqua 2016 Summer Concert series. Concerts will be happening all summer long. See the June schedule below. NoBo Art District’s First Friday is a FREE self-guided tour of artists’ studios and creative businesses in the NoBo Art District. Meet painters, sculptors, photographers, designers and other artists along your stroll through the area. Attendees will also enjoy live music, demos and special activities in many locations. Located along Broadway from Pine Street to Highway 36. Follow the polka dots and pink flags to find surprises around every corner. Guided walking tours led by a NoBo Art District member. will visit 4-5 NoBo artists in their studios at 6:30 pm at 4635 Broadway, ACE Community Art Gallery. Visit the NoBo Information Tent in front of Ace Community Art Gallery, 4635 Broadway for a map of the studios open for First Friday and for answers to any questions. Cost: $5 – $65 + Cost of optional extras. Tickets can be purchased here. What’s The Burning Can Festival at Lyons Outdoor Games? Adventure, Music, Craft Beer, & Rocky Mountain Revelry. For 2017 Oskar Blues & the Town of Lyons have combined two festivals to create the best weekend of the year. 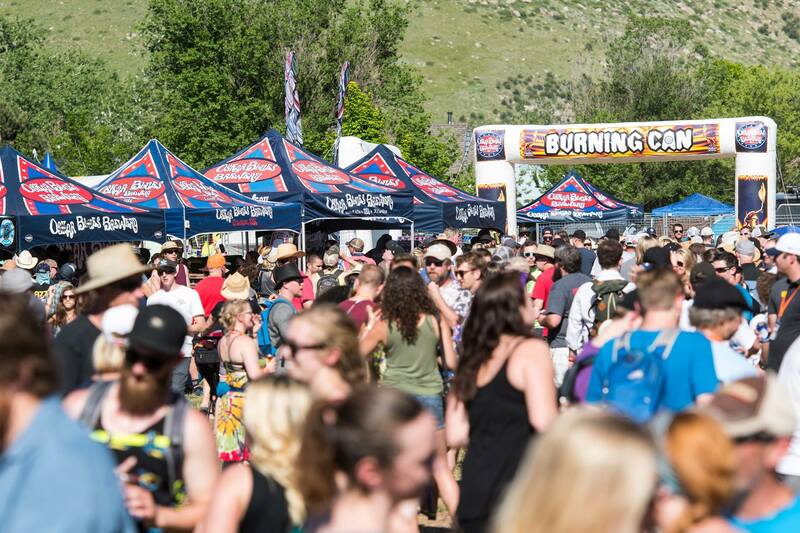 The Burning Can Festival promises to be the perfect weekend for lovers of adventure, beer, music, and camping. To start the day, you can take on a trail running relay with your best buds, take a mountain bike on the local single track, or laugh with the kids in a huge KidZone. As 60+ breweries start pouring their beers, festivalgoers can check out dog jumping, a slackline competition, or BMX dirt jumping while enjoying over 200 canned craft beers. The music begins with Mo Lowda & The Humble, Orgone and builds to a performance by RUBBLEBUCKET! When the music ends, the lighting of the ‘Can’ caps off the night and the stars fill the sky as campsites are filled at the base of the Rocky Mountains. Mellow Sunday morning activities include yoga, hikes, strong coffee, and fresh breakfast tacos. For the full schedule click here. The mission of Burning Can at Lyons Outdoor Games is to raise funds and awareness for the Can’d Aid Foundation and the Town of Lyons Park, Recreation and Cultural Department and to keep Lyons growing as a vibrant, unique and outdoor-oriented Colorado community. Our vision is simple: for every person to leave Burning Can at Lyons Outdoor Games stoked to live a more adventurous life! Leashed dogs are welcome. Tent and Camping Spots are available to reserve when you purchase your ticket online. Offering fresh fruit, flowers, veggies and delicious edibles, the Boulder Farmers’ Market provides a place for locals to sell their products in a friendly, fun environment. Twice a week, residents and visitors can fill their bags with goodies. The Taste of Louisville returns June 3 to celebrate Louisville’s amazing selection of food and drink! Attendees can check out Louisville’s fine restaurants, favorite local breweries, arts & craft booths, kid’s entertainment and informational booths from local merchants. Don’t miss the Louis-Palooza which features local bands performing at the Steinbaugh Pavilion. The Louisville Rec Center will be hosting “Touch a Truck” from 9:00 to 11:30 a.m. This will also be the opening day for the Louisville Farmer’s Market. Join hundreds of runners from all over for the Taste of Louisville Race at 8:30 AM. Runners will run through Historic Main Street in Louisville, right through all the action of the Taste of Louisville and continue on throughout the beautiful community of Louisville. Visit www.louisvilletasterace.com for all the details. Once again, Twenty Ninth Street is going to rock, swing and jive with the summer concert series beginning June 3. Join the fun at Twenty Ninth Street’s Central Plaza next to West Elm, where The Barrel is located for food, drinks and dancing under the stars. Discover, learn and have fun on the Superior trail system with a morning of cool activities sponsored by the Open Space Advisory Committee. For National Trails Day, run with the Running Club on a 1-2 mile out-and-back that meets at the Coalton Trailhead at 8:15 AM, see a bald eagle, owl and hawk with Hawk Quest from 9:30-10:30 AM, touch a live snake with the Center for Snake Conservation from 11:00 am-12:00 PM. Also, learn about trails with the Boulder County Rangers, talk about Leave No Trace with the Boy Scouts. Don’t forget to bring a hat, sunscreen, water bottle, chair and your love for trails! Held at the Twenty Ninth Street Retail District each spring, the Boulder Home & Garden Fair offers an extensive array of ideas, inspiration and innovation to improve your living environments. 60+ vendors including local builders, landscape and garden specialists, an array of home improvement and green living experts, and unique product vendors. Plus — come enjoy live music all day, food trucks on-site, and a paw-tastic pet parade! The Garden Pawty Pet Parade, hosted by the Boulder Home & Garden Fair, will benefit Summit Dog Rescue. Registration begins at 12, pet parade starts at 12:30. Every dog wins a prize and top prizes will be awarded for best costumes! Strutt Your Mutt for a great cause. Suggested donation is $5 per dog, all proceeds go to Summit Dog Rescue. Click here for the registration form. A kid favorite. Join the musical duo Jeff and Paige for evenings of children’s music and nature education. The evening consists of a short hike, followed by 45 minutes of nature music at the foot of the Flatirons. Sponsored by City of Boulder’s Open Space and Mountain Parks Division Meadow Music is an award-winning environmental education program at Chautauqua Green in Boulder, Colorado.! The event begins at 5:30 with a short hike that’s friendly to all ages (please arrive early to find a place to put your picnic blanket before the hike). After the hike, the group returns to Chautauqua Green for a concert full of original nature and science-based music by Jeff and Paige. The concert starts around 6:00pm and ends by about 7:00. Bring a blanket to sit on, a picnic and some silliness! From oldies to alternative and everything in between, Bands on the Bricks is Boulder County’s premier outdoor summer concert series taking place in the heart of the city on the bricks of the one-and-only Pearl Street Mall. A not-to-be-missed summer tradition with 10 weeks of free concerts. Enjoy performances from the best local musicians along the front range while dancing under the stars. Featuring an outdoor beer/wine/margarita garden starting at 5:30 p.m. every Wednesday night, featuring Rio Margaritas and a local brewery. This summer’s brewery line-up includes: West Flanders (June 7 – July 5) and Avery Brewing Company (July 12 – August 9). Cost: $92 and up, Tickets available here. Dead and Company, featuring John Mayer and Grateful Dead band members, take to the stage in June for what promises to be another epic performance at Folsom Field for the second year in a row. Where: Briggs St. in old town Erie between Moffat St. and Wells St. Cost: $35 Advance / $40 Day of Event- ticket sales are final, no refunds. The 5th Annual Erie Brewfest features 30 local breweries offering their best IPA’s, ambers, and more! Ticket includes entry down Brew Lane with your commemorative EB tasting glass as you enjoy live music and great food. Designated drivers are no charge. Cost: $30, tickets available here. Come explore the fresh sprouting plants of spring with two local herbalists on an informative and fun Spring Herb Walk, hosted by Rebecca’s Herbal Apothecary. Learn about the medicinal properties of plants as well as botanical tools to continue to identify plants on your own! Wear appropriate clothing for the weather and bring water, a notebook and pen. Location to be announced. Registration required at https://www.rebeccasherbs.com/. Cost: Free, reserve your spot here. Whether you are a current boot camper, past boot camper, or have never joined up before, you are invited to start your weekend off with an invigorating bang at Second Saturday Drop-In Trail classes with FitLIV. During Second Saturday trail days, your trainer and group will stop every few minutes along the trail for a strength and cardio interval. You’ll never know what is around the next corner and what your trainer has planned next. You will learn how to turn an ordinary jog into a full-body workout using the outdoors as a virtual weight room. By the end of class you will have incorporated rocks, trees, benches, steps and more and will have sweat on the brow, a smile on your face. Where: Find course maps here. Time: Each day’s schedule varies, specific times here. Watch the largest IRONMAN race in the world at the finish line and throughout the day as over 2,000 incredible athletes compete. The race will start at the Boulder Reservoir with a single-loop swim. Once finished in the water, will continue on to a beautiful multi-loop course all contained in Boulder County. The two-loop run course runs along Boulder Creek Trail, winding along the water and through city parks. Spectators will have multiple opportunities to cheer on the athletes and the last few steps of the day will take athletes up Pearl Street for a triumphant finish. View the IRONMAN website for course maps. Kids can participate in the IRONKIDS Fun Run, A non-competitive and non-timed event gives kids 15 or younger a chance to take part with a 1/4-mile or 1-mile run. Each athlete receives a race bib, finisher shirt or trucker hat, medal, goodie bag and the pride of calling themselves an IRONKID! More info here. Time: Times vary, check schedule here. The Colorado Shakespeare Festival was founded in 1958 and is still going strong. Held every summer at the picturesque Mary Rippon Outdoor Theatre and the indoor University Theatre on the University of Colorado Boulder campus, this festival is consistently among the most critically acclaimed of its kind in the nation. CSF’s award-winning education program also presents classes, workshops and camps for all ages throughout the year. Cost: $14 – $18, tickets available here. Join Parlando School of Musical Arts for their 2017 “Summerstock” staged musical: The Sound of Music. Witness some of Boulder’s best young musicians and performers for this timeless, family-friendly classic. Cost: $357-$997, tickets available here. Hanuman Festival is a community-oriented yoga and music festival set at the foot of Colorado’s Rocky Mountains. Join us in Boulder, Colorado for a celebration with world-class yoga instructors, mind-blowing music, inspirational experiences and a nourishing community. Immerse yourself in body, mind and heart as you relax and rejuvenate, dance and devote, connect and expand, have fun and just be. Boulder Ballet is presenting a FREE concert of classical and contemporary ballet in the park. The perfect event for families on a summer evening. Show length is one hour. Time: Times vary, view schedule here. Cost: Many events free, some require tickets. See schedule here. Introducing the inaugural event that is sure to become a staple in the cultural offerings of Boulder—the Boulder Plein Air Festival—a week-long celebration of remarkable landscapes, scenic cityscapes, unique workshops, and wonderful free events from June 11-18, 2017. Open Studios invites you to observe 20 master painters in action—making their art on location in beautiful Boulder County, Colorado. You are also invited to participate in the creativity yourself, with plenty of festival activities open to public participation. Kids art opportunities available. Celebrate creativity with us and enjoy receptions, exhibitions, lectures, and opportunities to collect your next masterpiece at the Boulder Plein Air Festival! Where: Various parks throughout Boulder, view schedule here. Cost: $12.00 – $54.00, tickets available here. Colorado Music Festival presents a six-week summer concert season at Chautauqua Auditorium in Boulder showcasing Music Director Jean-Marie Zeitouni and the Colorado Music Festival Orchestra. Inspired programming performed by exceptional national and international musicians has earned Colorado Music Festival recognition from the League of American Orchestras and the National Endowment for the Arts. Full schedule available here.